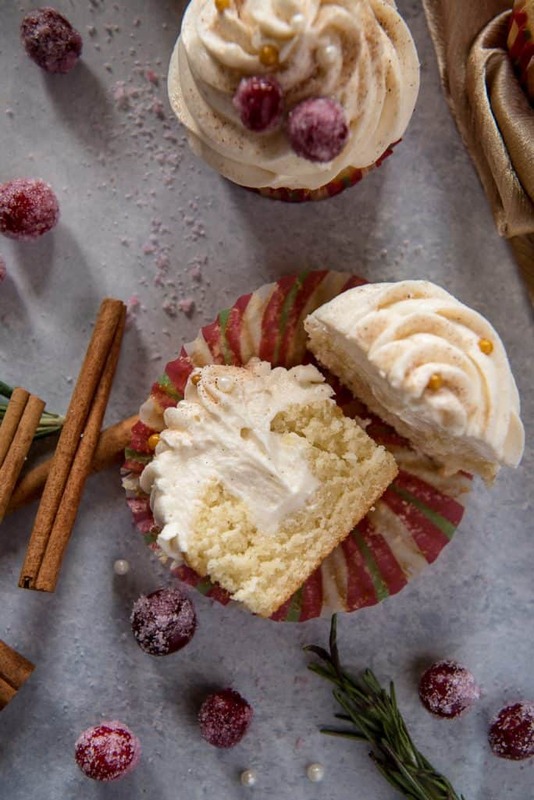 These fluffy Horchata Cupcakes, flecked with vanilla bean, are filled and topped with a boozy whiskey buttercream that’s sure to please all the cinnamon lovers in your life! You guys know how much I love to bake with booze, right? It’s not a secret that any time I can jam some liquor or wine into a recipe, you can bet I will. Sometimes, it’s just my OCD requiring me to not waste those last few glugs of champagne from three days ago. Or using up half a beer that Abe fell asleep before finishing the night before. Or trying desperately to empty the giant bottle of cheap rum that’s been clogging up my liquor cabinet for the last two years. 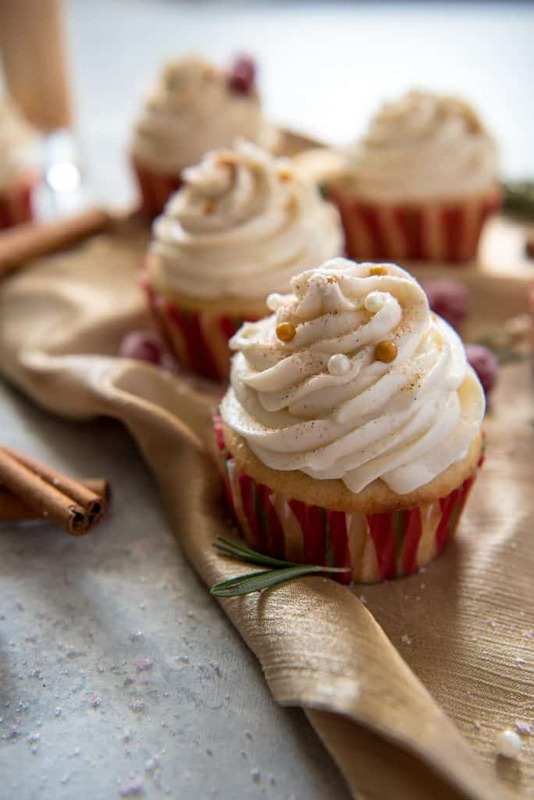 In the case of these Horchata Cupcakes…I just really wanted to make them. I even bought a fresh bottle. 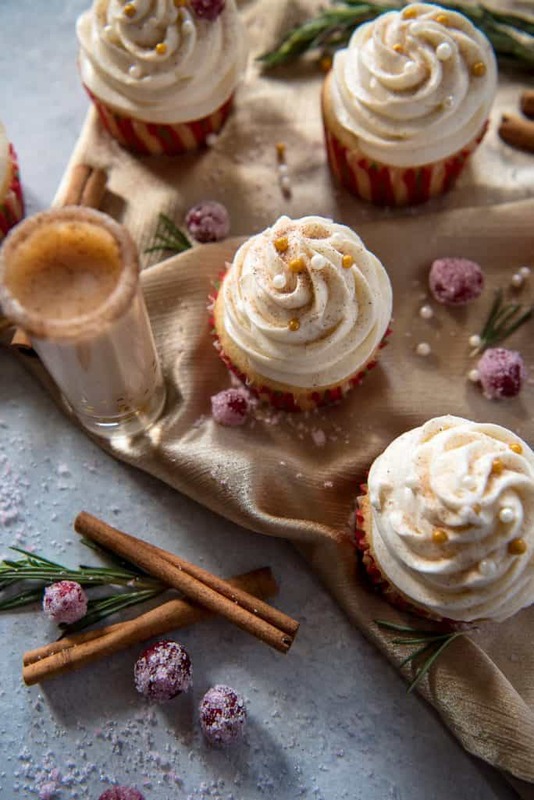 There are so many pros to making these horchata cupcakes! First of all, versatility. Holy moly. So, Christmas is in less than two weeks – and these are perfect for the dessert table, no? BUT say you’re reading this after Christmas? Or in April? October? They’ll be fabulous any time of the year. Hello? Horchata has no season. You could make them on any given Taco Tuesday and thrill the hell out of your spouse or neighbor or grandpa because cupcakes. Cupcakes are always welcome. Switch up the sprinkles, or leave them off completely, and you’ve got an evergreen treat in your back baking pocket. The cupcakes themselves are pretty standard, and might even become a go-to for you – if you’re into the not-so-sweet kind. 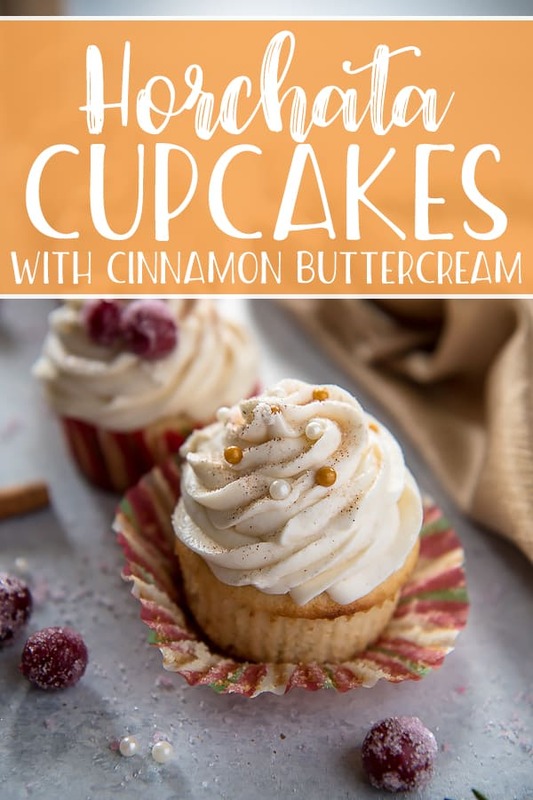 They almost bake up tasting like a soft, fluffy vanilla muffin, making them the perfect vehicle for the sugary cinnamon buttercream. Protip: When baking your horchata cupcakes, be sure to put them in a 400-degree (Fahrenheit) oven for 5 minutes, then drop the temp to 350 for another 10 or 12 minutes. You’ll end up with beautifully domed little cakes that you’ll almost feel bad about covering in frosting. Of course, I used RumChata in my horchata cupcake batter, but if you want to use the actual non-alcoholic horchata instead, you’re more than welcome. The alcohol bakes out of them, and you’re left with a slight cinnamon/rum flavor. As for the cinnamon buttercream – if you leave the booze out, you’re making churro cupcakes. Just a heads up. The buttercream is what brings these horchata cupcakes to life y’all! 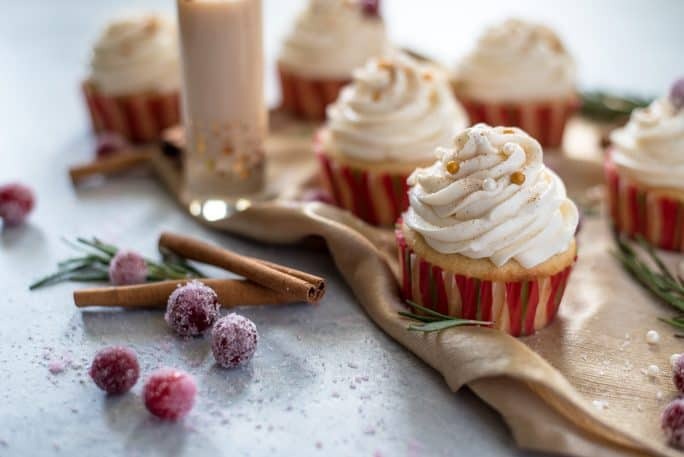 More RumChata and some cinnamon Fireball Whiskey = fluffy, creamy, mouthwatering frosting you’ll be eating with a spoon. You know what would be a super cute way to serve these at a party? Make the cupcakes into minis and pipe little rosettes of buttercream on top. 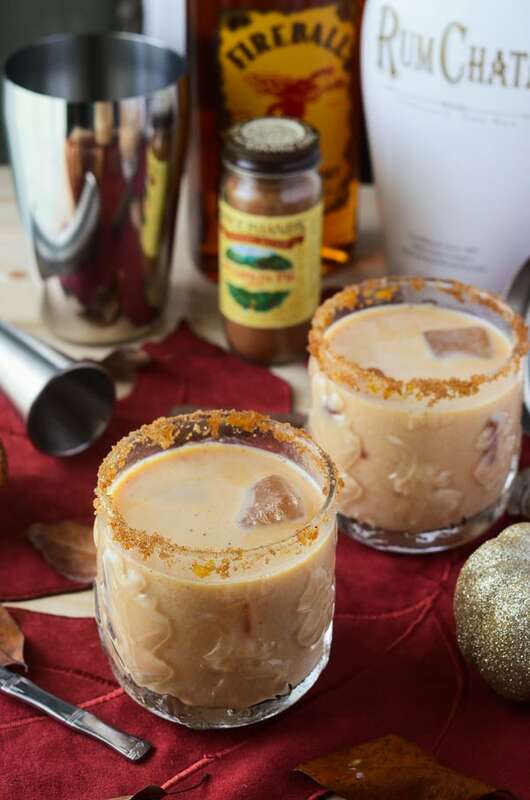 Fill tall shot glasses with Cinnamon Toast Crunch shots (equal parts RumChata & Fireball), then plop the cupcakes inside, just hovering above the liquor line. I see your New Year’s Eve coming together already. 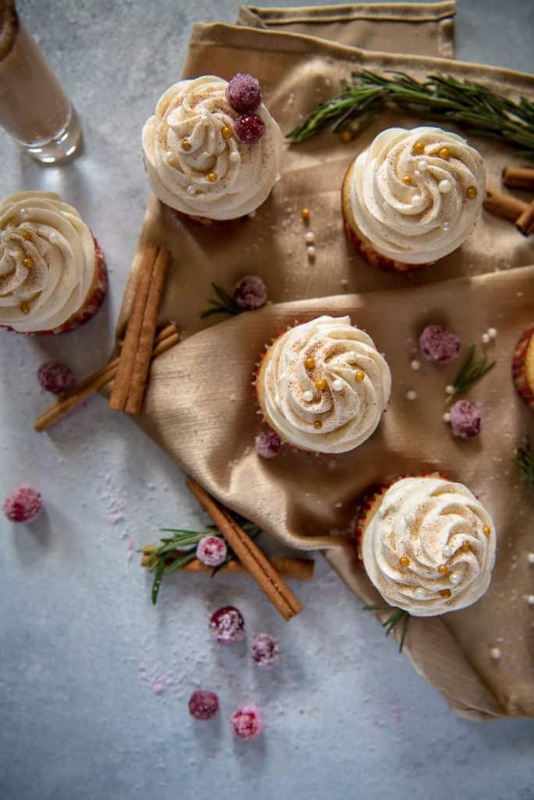 Make your holiday table a cupcake buffet! 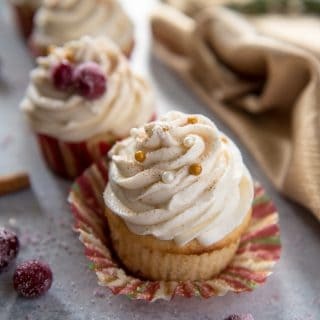 These fluffy Horchata Cupcakes, flecked with vanilla bean, are filled and topped with a boozy whiskey buttercream that's sure to please all the cinnamon lovers in your life! Preheat oven to 400 degrees F. Line a standard cupcake pans with 10-12 liners and set aside. In the bowl of a stand mixer, cream butter and sugar 3 minutes until light and fluffy. Add eggs and vanilla, mixing until blended well. Add the milk/horchata and flour mixture in alternate additions, beginning and ending with flour. Mix until just combined - don't overmix. Fill the cupcake liners 3/4 of the way full, and bake for 5 minutes at 400 degrees, then reduce heat to 350 and bake an additional 10-12 minutes, until a toothpick inserted in the center comes out clean. Remove from oven and allow to cool in pan for 5 minutes, then move to cooling rack. 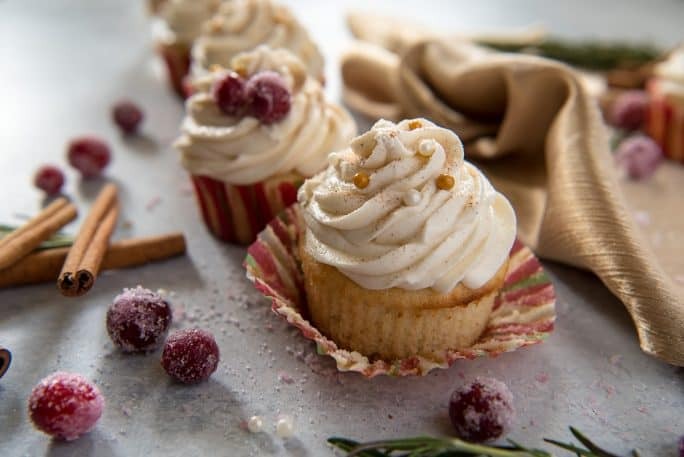 When cool, use a cupcake corer or small knife to make a well in the center of each cupcake. While cupcakes are baking, make buttercream. In a KitchenAid stand mixer fitted with a whip attachment (or with a hand mixer), add butter and sift 2 cups of powdered sugar over it. Beat on low to combine, then increase speed to high for 3-4 minutes to blend. Add vanilla, Horchata, Fireball, and salt, and blend on low until incorporated. Taste and add 1-2 more cups powdered sugar as necessary to reach desired flavor and consistency. Once incorporated, increase speed to high and whip for 3-4 minutes until fluffy. 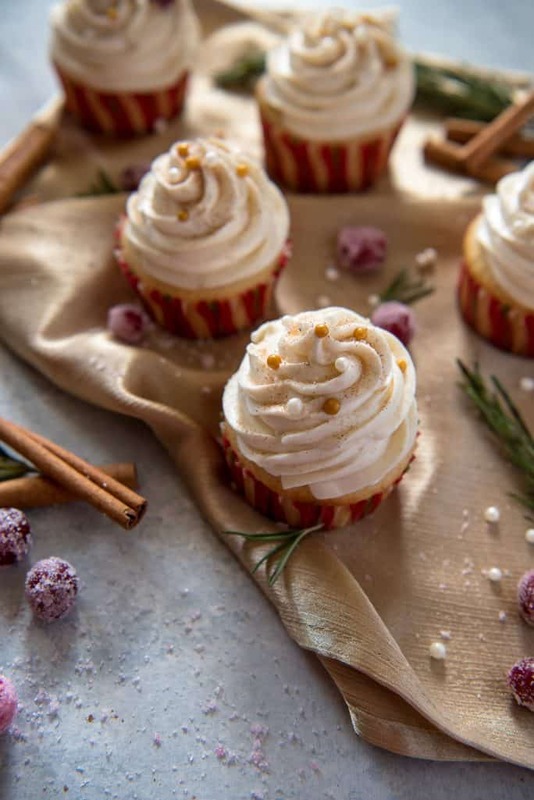 Spoon into a piping bag and fill each cooled cupcake with frosting, then top with desired amount. 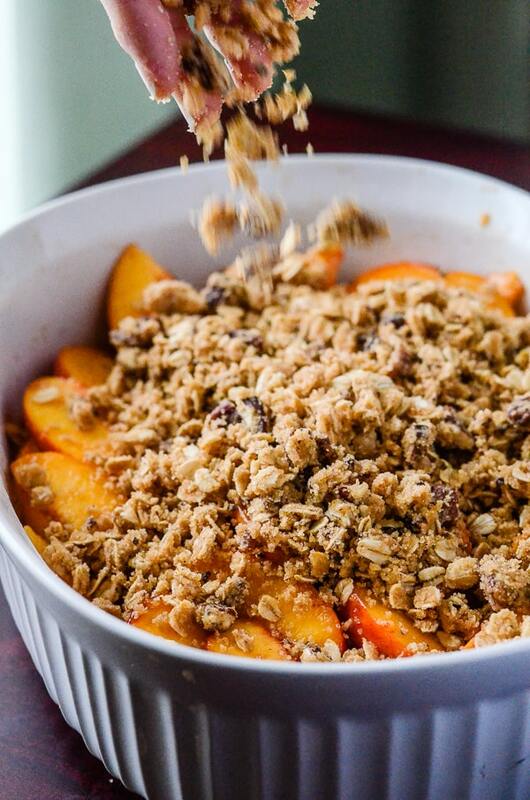 Garnish with dragee sprinkles and cinnamon sugar. Serve and enjoy! 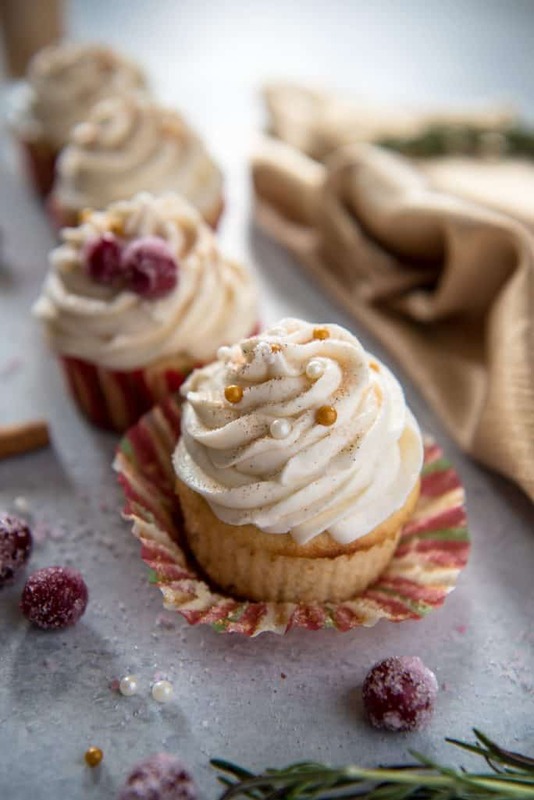 PIN THESE HORCHATA CUPCAKES WITH CINNAMON BUTTERCREAM FOR LATER! Got a taste for more cupcakes? Try one of these other Horchata & Fireball-friendly recipes! 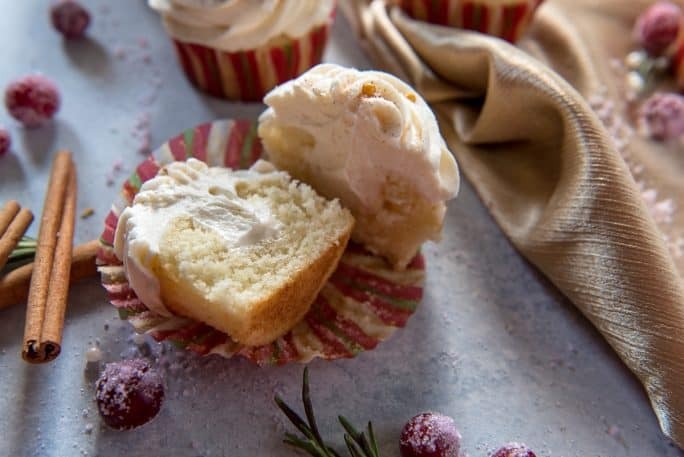 I definitely need boozy buttercream in my life during the holidays!